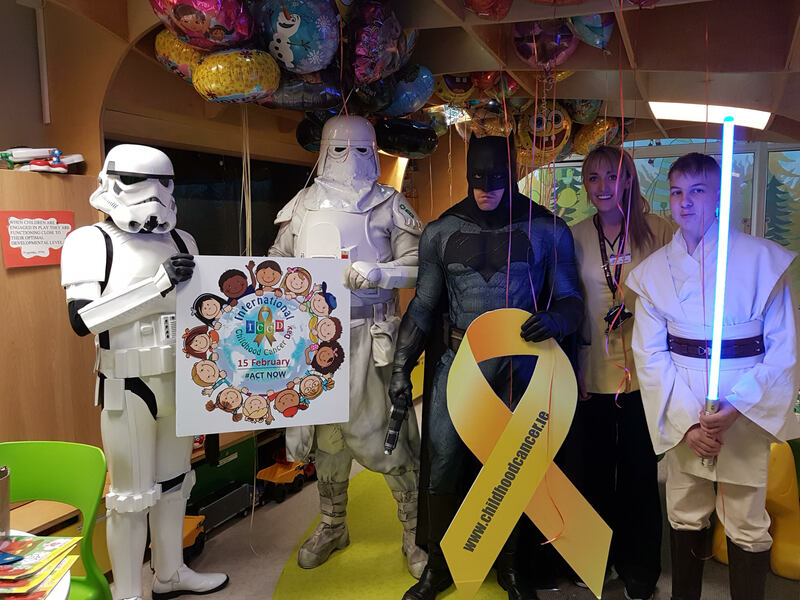 Credit: Fionnuala Walsh Storm troopers and Batman bringing a smile to sick kids at Crumlin. <dropcap>T</dropcap>he capacity to show kindness is perhaps what defines goodness: for one young man who battled brain cancer, this capacity allows him to give back to the hospital ward that treated him in a novel way. Dylan Smith Bresnahan was a brain cancer patient at St. John’s children’s ward in Crumlin hospital and he uses his Jedi costume and his love of Star Wars to bring a little cheer to patients in the ward. Dylan was diagnosed with medulloblastoma, a form of brain tumour, in 2012. He finished treatment a year later and is still under the supervision of Crumlin. The Emerald Garrison is a Star Wars costuming club who began visiting Crumlin hospital in 2014. Dylan’s mum Gillian explains how it totally changes the atmosphere on the ward – she too dresses up. According to Gillian the visits make a huge difference in the life of a child in a ward. “The last visit, there was a little girl who was about two and a half. She came right in and was looking up at Batman, who’s over six foot in his costume,” she said. “When these guys come in they come out of their rooms and down to the play room. They try and engage with them, they might hold their light-sabers hold the guns, and mess around,” Gillian says. She recalls a little boy from Donegal, who was making a one day trip for an anaesthetic. “He was miserable and his mam brought him over to see the lads in costume and it totally brightened him up,” Gillian reflects. The Emerald Garrison are the official charity partners of the Childhood Cancer foundation, of which Gillian is a founding member. “It was started by parents, and it helps people dealing with cancer in children because we saw there was a need for it, there was no such charity for like-minded parents. There were a couple of us involved in it, we went through treatments together so we set this up,” said Gillian. Jessica Murphy, another member says that they’re “just like big kids dressing up for Halloween”. “They come over to you, giving you big hugs and tugging at whatever props you have with you. It’s just something different for them, especially if they’re in the hospital and they’re waiting for treatment. I’d say it can be very, very boring for them and it’s nice to make a little difference to their whole view of the hospital and about being there sick,” she said.